My skin hates me at the moment... layers of makeup melting into every pore in the summer heat, three hours of sleep a night (if I am lucky). What I do hate though is its way of showing displeasure – zits like I haven’t had since the age of 14 in places where I never had them even when I was 14, blotchy patches that make any kind of cover-up crease and crumble, skin that looks grey and lifeless. Ugh! So, it’s time to make amends... 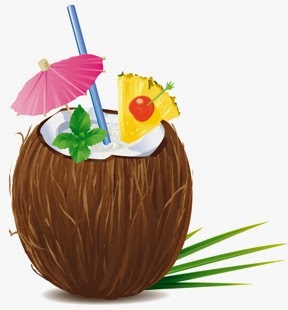 I overheard at the beauty salon, the pedicurist started talking of a recipe that combines pina colada delectableness with loads of skin soothing benefits, how could I resist? A quick trip to the market and 10 minutes in the kitchen later, I can honestly vouch for its deliciousness. The skin benefits, I assume, will take a little more time to show up but when they do, I will be happier. The yummy drink contains an omega buzz that ups detoxification, boosts blood circulation and raises energy levels, and medium-chain fatty acids that make the complexion glow. In the long term, this coconut-almond-and-avocado pina colada is also supposed to help you lose weight, lower cholesterol and reduce the risk of cardiovascular diseases. And yup, you can enjoy this healthy cocktail virgin (or not – I definitely did nothing of the sort! ).